There is just one lecture meeting to come in the present session on Thursday May 21st at which Roger O’Brien, Open University and HSS, will talk on: ROSETTA – A COMETARY CLOSE ENCOUNTER. In August 2012, after a 10 year journey through the Solar System, ESA’s space probe Rosetta finally arrived at its target, the comet 67/P Churyumov – Gerasimenko. In November 2014 it attempted to deposit a lander on the surface of the comet, which it achieved with partial success. In the meantime Rosetta was placed in orbit around the comet and has transmitted many close-up images of the nucleus. During his talk, Roger will outline the mission and discuss the results to date. I look forward to seeing you at the meeting. The current session will end with the ANNUAL GENERAL MEETING on Thursday June 25th. As usual it will be preceded by wine & cheese for which there is a small charge of £3.00. Any contributions to the refreshments are always welcome. This year, we are hoping that the scientific entertainment will consist of demonstrations of 3D printing. At the Council meeting on April 9th, Roger O’Brien asked to stand down due to other commitments. We thank Roger for all his help in the past and hope that he may return to Council in the future. Sad News: We have recently received the sad news that Dr. Jamie Nelson has passed away at the great age of 101. An obituary will appear on our web-site in due course. In the meantime we send our condolences to his family and many friends. ASTEROIDS, WATER and the search for extra-terrestrial life. Between the orbits of Mars and Jupiter, there is a wide region of space occupied by numerous Minor Planets or Asteroids. These bodies might be the result of a planetary collision way back during the early formative period of the Solar System, or they might be left over material which for some reason did not accrete to form a planet. They are mostly quite small bodies which are invisible to the naked eye so it is not surprising that they were not discovered until 1801. The way in which they were discovered is fascinating. In 1766, a mathematician named Titius of Wittenburg found an interesting relationship between the distances of the planets and a series of numbers. However, he failed to publish his work. In 1772 Johann Bode did publish it and he took the credit for it as well, so it is now known as “Bode’s Law”. If we take the numbers: 0, 3, 6, 12, 24, 48, 96, 192, 348, each of which, apart from 3, is double its predecessor, and then we add 4 to each number we get : 4, 7, 10, 16, 28, 52, 100, 196, 388. If we now divide by ten, we get 0.4, 0.7, 1.0, 1.6, 2.8, 5.2 etc. corresponding quite well to the distances of the planets from the Sun in Astronomical Units. (Earth = 1 AU). The planets Uranus, Neptune and Pluto were undiscovered at the time of Bode and Titius but when Uranus was discovered by Herschel in 1781, it fitted in nicely! There was, however, no planet corresponding to 2.8, which should lie between the orbits of Mars and Jupiter. In 1800 a group of German astronomers decided to search for this ‘missing’ planet. The group was headed by Johann Schroter and they were nicknamed the ‘Celestial Police’. Success was soon to come and on new year’s day 1801, one of their number Guiseppi Piazzi, found an 8th magnitude object in Taurus which he did not recognise. This object showed movement when he observed it 24 hours later. The ‘new planet’ was named Ceres. However, Ceres turned out to be disappointingly small at just about 1000 km. in diameter, so the search continued. Then, in 1802 Heinrich Olbers found Pallas, but again it proved to be a small body. Discoveries continued with Juno in 1804 and Vesta in 1807, and discoveries continue to this day! It has been estimated that the Asteroid belt could contain more than a billion small Planetisimals and we already know the orbits of over 25,000 of them! Most of the Asteroids are small irregular shaped chunks of rock most of which are less than 1 km across and the majority are far smaller than this. Ceres at just 1000 km. in diameter is by far the largest. It was once thought that the Asteroids were the remains of a large planet which had been broken up in a cosmic collision with some unknown body such as a passing comet. Today the consensus of opinion is that the asteroids were actually material that was prevented from joining together to form a planet when the Solar System was being formed, the asteroids began to crash into one another at huge velocities, causing even greater fragmentation. The process continues to this day but at a much reduced rate. Collisions within the asteroid belt are responsible for producing many meteorites and the vast quantities of Cosmic Dust, which fall to Earth each year. Jupiter may have been responsible for disrupting the asteroid belt during its early development with tidal forces preventing the material from compacting, but the true origins of the asteroid belt remains uncertain. Many of the asteroids have very eccentric orbits. Some have orbits outside the main belt and are associated with planets. The Trojan group for example, orbit the Sun every 12 years with Jupiter. There are over a thousand Trojans in two groups. One group is ahead of the planet and the other follows it. They lie in regions known as the Lagrangian points. Lagrangian points are areas in which small bodies can maintain a stable orbit even though they are under the influence of the gravitational field of both Jupiter and the Sun. In the case of the Trojans, these points are located 60 degrees ahead and 60 degrees following Jupiter. Other groups such as the Amors, have orbits which cross that of Mars, while the Apollo group, which numbers in excess of 2000 objects, crosses the orbit of the Earth. These could represent great danger. It has been suggested that the various species extinctions on Earth, which occurred in geological times, including the extinction of the Dinosaurs, might have been the result of a sizeable asteroid collision with the Earth. This threat is being taken more seriously today and there are certain projects such as the LINEAR – Lincoln Near Earth Asteroid Research, project, which constantly monitors the sky, looking for objects which might pose a threat to our planet. There have been a number of space missions into the asteroid belt. The Galileo probe passed close to Gaspra on its way out to Jupiter in 1991. It sent back close up pictures of an irregular shaped rock peppered with impact craters. Two years later, Galileo passed Ida. Then in 1997, the NEAR space probe was dispatched to actually land on the minor planet Eros, a mission which it successfully accomplished in 2001. On the way it passed and imaged Mathilde. Currently, NASA’s ‘Dawn’ mission is busy taking a close look at Ceres, having already passed and investigated Vesta in 2012. Until quite recently the asteroids were regarded as fragments of planetary type material left over from the building of the Solar System. They vary in size from a few centimetres to nearly 1000 kilometres across. Most are irregular shaped rocks that have remained unchanged since the formation of the Solar System nearly five billion years ago and as such, represent primordial material. Examination of their spectra shows that some are similar in composition to the carbonaceous chondrites we see as meteorites. They contain certain amino acids and other organic compounds that form some of the building blocks essential for life. But until recently there was no evidence in the asteroid belt for the one essential compound necessary for life – Water but this was about to change. Astronomers working at Mauna Kea in Hawaii began to study the spectra of certain asteroids as did the Spitzer Space Telescope. Initially two asteroids 24 Themis and 65 Cybele (dia. 290 Km) showed the presence of water and organics. In September 2007, NASA launched its ‘Dawn’ mission to the asteroid belt to examine Vesta in 2012 and then on to Ceres in March 2015. 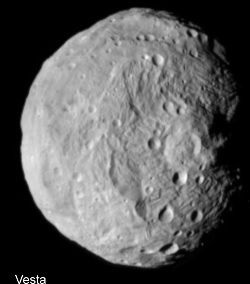 Vesta seems to be composed of basaltic minerals and is dry. This was expected as we have specimens of meteorites, the HED – Howardite, Eucrite, Diogenite meteorites known to have originated on Vesta. 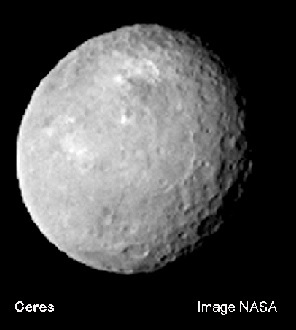 Ceres however, is a different ‘kettle of fish’. Ceres is just under 1000 km. in diameter and is the largest member of the asteroid belt and was the first asteroid discovered by Piazzi in 1801. It is composed of rock and ice and its composition resembles carbonaceous chondrite meteorites. But the main difference is that whereas Vesta is dry, Ceres is decidedly wet and is spraying water into space by a process of ’Cryo-Vulcanism’; it has been estimated that Ceres may actually contain more water than is in all the Earth’s oceans! These discoveries are causing Astronomers to revise their theories on conditions in the early Solar System – the asteroid belt is certainly not the desert we once thought it to be and asteroids themselves are proving to be very interesting bodies indeed. They seem to fall into two distinct types, those composed of dry basaltic minerals like Vesta and those that are a mixture of rock and ice. We did not expect to encounter ice so close to the Sun. 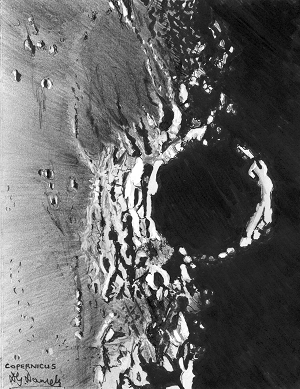 But water, in the form of ice has also been discovered in deep permanently shadowed craters at the south pole of our own moon; few of us expected that. It was presumably deposited by huge icy bodies colliding with the moon shortly after it began to cool and develop a crust. Between 4100-2500 MYA the inner Solar System was suffering from the ‘late heavy bombardment’ and both Earth and Moon were liberally peppered with impacts. Was it at this time that Earth acquired some or all of its water? Further out in the Solar System, water has now been detected on Jupiter’s moons Europa and Callisto. 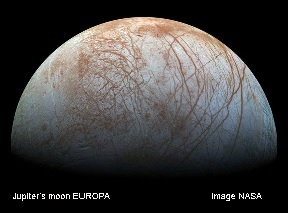 Radar observations indicate that below Europa’s ice-bound crust, there is a deep salty ocean. As Europa orbits Jupiter, the tidal effects of the gravitational fields of Jupiter and the other Galilean moons, constantly squeeze the satellite heating up its interior. We can observe this effect taking place on Io – Jupiter’s innermost moon. The heating is sufficient to cause active volcanoes all over the surface of this satellite. On Europa, we can imagine the existence of hydrothermal vents at the bottom of its deep oceans, similar to the ‘black smokers’ in Earth’s oceans and possibly supporting colonies of extremophyles just as they do on Earth. We may get some answers in 2022 if the proposed ESA JUICE (JUpiterICE) mission, to look for indications of life on Europa and Ganymede is successful. 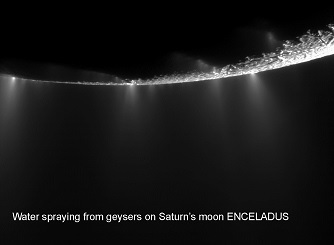 One of the biggest surprises was delivered by the Cassini/Huygens mission to Saturn, when it was discovered that Saturn’s moon Enceladus has features that can only be described as geysers in its polar region that are spraying water into space and forming another ring of ice surrounding Saturn. Bearing in mind that the ambient temperature in the region is only a few degrees above absolute zero, it would seem that Enceladus is another moon that is being warmed by tidal forces with an icy crust overlaying a vast ocean of water. So where did all the water on Earth come from? Until very recently we thought that it possibly came from comets which impacted with the newly formed planets very early in the history of the Solar System. The comets originated far out in the Kuiper-Edgeworth belt and the Oort Cloud, far across the protoplanetary disk where temperatures were lower allowing ices and more volatile compounds to form. The comets acted as a kind of delivery service, transporting water in the form of ice to the inner reaches of the Solar System. However, this theory may no longer be sound thanks to the recent observations, some of which were made by the Rosetta/Philae space probe which successfully placed a ‘lander’ on the nucleus of comet Churyumov-Gerasimenko in August 2014. The observation concerns the proportion of deuterium in the comet’s water vapour. Deuterium is hydrogen plus an additional neutron, sometimes called ‘heavy hydrogen’ and the D/H ratio acts like a fingerprint for water. So far, eleven comets have been tested for D/H ratio and only one – 103P(Hartley2) has the same D/H ratio as Earth’s water. However, samples from asteroids do appear to have the required D/H ratio. So it may be that asteroids and not comets colliding with the Earth were responsible for our abundant water supply. Moreover, as certain asteroids seem to contain a whole raft of organic compounds and amino acids as well as water, is it possible that they could have seeded the Earth with life? There is a certain irony in this as over geological time there have been several massive species extinctions on Earth due to the impact of asteroids and there are certain to be more in the future. It could well be the case that asteroids were responsible for life beginning on Earth and that one day they will also be responsible for its ending . 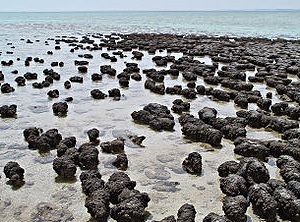 Stromatolites in Shark Bay Australia. their ancestors may have been amongst the earliest life forms on Earth. In the meantime, our search for planetary systems surrounding other stars continues and each year the count goes up and now stands at over 1000. It has recently been suggested that in fact all stars probably have planetary systems as they are a natural consequence of star formation. This means that in our galaxy alone there could be as many as 500 billion planetary systems. Looking further afield, water and a whole range of organic compounds have been detected in the Orion Nebula, that gigantic molecular cloud 1600 light years distant. Here new stars are forming surrounded by dusty disks; these are embryonic planetary systems and they too will have water and perhaps will also have the right conditions for life to develop as well! In the observable Universe there must be literally trillions of planets, many of which could support life. Surely we can not be so arrogant to believe that our tiny planet is the only abode of life in such a vast Universe. Although as yet we have no proof, I believe that life, like gravity is a property of the Universe and that given the right conditions and time scale it will take hold and evolve. If we wish to discover signs of extraterrestrial life, perhaps we should concentrate on regions where we can detect the presence of water. The expression “The Water of Life” might prove to be an absolute truth. Until the application of photography to astronomy, in the early 19th century, astronomers were required to make drawing of their observations. Even today, when we have advanced photography and CCD imaging at our disposal, many of us still like to draw what we observe. Why? Few astronomers are trained artists and attempting to draw accurate representations of the sometimes complex and delicate images encountered in astronomy can be a daunting task. I believe that it is the very nature of the challenge that attracts many of us. We could ask the question “Why bother to draw lunar formations at all?” since the entire surface of the Moon has now been photographed and mapped to a resolution of about a metre. “Why should we spend long hours in the dark squinting through a telescope often in the cold, at an image bubbling with atmospheric turbulence and all the while attempting to draw features which have already been well documented?” I believe that there are a number of reasons why we do this. To begin with, there is a far greater sense of achievement to make a drawing, combining the skills of both eye and hand. It is this sense of involvement with the subject that makes us look through telescopes in the first place. We could just look at pictures in books, many of these will show far more that most of us can see through our small instruments – but where is the fun in that! For my own part it is a way of becoming really intimate with the lunar surface. If I take a photograph or a CCD image of a region of the Moon, I will study it for a while and then file it, but no matter how much I examine the image I will not really get to grips with nature of the surface until I draw it. When you draw, you have to look closely at each little feature - how it relates to its neighbour, how the shape of its shadow gives a clue to its real shape. It is only when you do this that you become really familiar with the lunar surface. A small telescope, even binoculars will reveal an enormous amount of detail on the Moon, enough to challenge any artist, but when you use a large instrument the task can be monumental! So much detail is revealed that it is impossible to record it with any degree of accuracy before the Sun rising above the lunar surface alters its appearance, you have to constantly modify the drawing. For this reason it is best not to try to draw a large area, better to concentrate on one formation. The drawings might take several hours to complete and because I am concentrating on small areas at a time I am in fact studying the image in great detail much more so than if I were merely looking at a photograph. It is this focussing of attention that ultimately leads one to a greater understanding of the lunar surface and the interaction of light and shadow. This is why, despite having the equipment to take photographs and CCD images, I still continue to draw the moon.